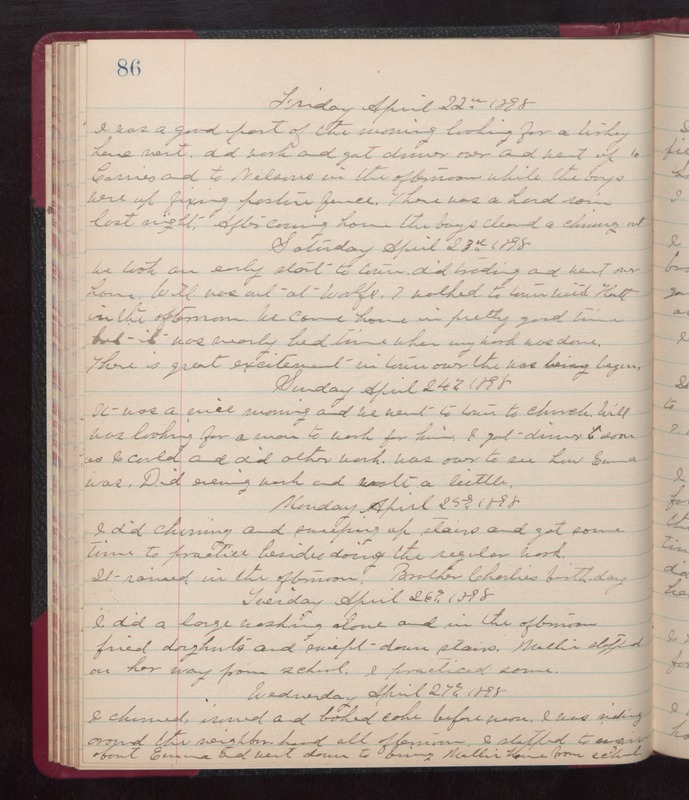 Friday April 22nd 1898 I was a good part of the morning looking for a turkey hens nest. Did work and got dinner over and went up to Carries and to Nelsons in the afternoon while the boys were up fixing pasture fence. There was a hard rain last night. After coming home the boys cleaned a chimney out. Saturday April 23rd 1898 We took an early start to town, did trading and went over home. Will was out at Woolfs. I walked to town with Hatt in the afternoon. We came home in pretty good time but it was nearly bed-time when my work was done. There is great excitement in town over the was being begun. Sunday April 24th 1898 It was a nice morning and we went to town to church. Will was looking for a man to work for him. I got dinner soon as I could and did other work. Was over to see how Emma was. Did evening work and wrote a little. Monday April 25th 1898 I did churning and sweeping up stairs and got some time to practice besides doing the regular work. It rained in the afternoon. Brother Charlie's birthday. I did a large washing alone and in the afternoon fried doughnuts and swept down stairs. Mollie stopped on her way from school. I practiced some. Wednesday April 27th 1898 I churned, ironed and baked cake before noon. I was riding around the neighborhood all afternoon. I stopped to inquire about Emma and went down to bring Mollie home from school.